Buddhist mala beads in nun's hand. Buddhist prayer beads or malas (Sanskrit: mālā "garland") are a traditional tool used to count the number of times a mantra is recited, breaths while meditating, counting prostrations, or the repetitions of a buddha's name. They are similar to other forms of prayer beads used in various world religions and therefore the term "Buddhist rosary" also appears. 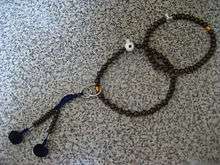 Buddhist prayer beads in its normative, informal secular style. Buddhist prayer beads at a Jodo Shin shop. In Tibetan Buddhism, malas of 108 beads are used. Some practitioners use malas of 21 or 28 beads for doing prostrations. In Tibetan Buddhism, malas are mainly used to count mantras. These mantras can be recited for different purposes linked to working with mind. The material used to make the beads can vary according to the purpose of the mantras used. Some beads can be used for all purposes and all kinds of mantras. These beads can be made from the wood of Ficus religiosa (bo or bodhi tree), or from "bodhi seeds", which come from rudraksha. Another general-purpose mala is made from rattan seeds; the beads themselves called "moon and stars" by Tibetans, and variously called "lotus root", "lotus seed" and "linden nut" by various retailers. The bead itself is very hard and dense, ivory-coloured (which gradually turns a deep golden brown with long use), and has small holes (moons) and tiny black dots (stars) covering its surface. Pacifying mantras should be recited using white colored malas. Materials such as crystal, pearl, shell/conch or nacre are preferable. These are said to purify the mind and clear away obstacles like illness, bad karma and mental disturbances. Using pearls is not practical however, as repeated use will destroy their iridescent layer. Most often, pearl malas are used for jewelry. Increasing mantras should be recited using malas of gold, silver, copper and amber. The mantras counted on these can "serve to increase life span, knowledge and merit." Mantras for magnetizing should be recited using malas made of saffron, lotus seed, sandalwood, or other forms of wood including elm, peach, and rosewood. However, it is said the most effective is made of precious coral, which, due to a ban on harvesting, is now very rare and expensive. Mantras to tame by forceful means should be recited using malas made of Rudraksha beads or bone. Reciting mantras with this kind of mala is said to tame others, but with the motivation to unselfishly to help other sentient beings. Malas to tame by forceful means or subdue harmful energies, such as "extremely malicious spirits, or general afflictions", are made from rudraksha seeds, or even human bones, with 108 beads on the string. It is said that only a person that is motivated by great compassion for all beings, including those they try to tame, can do this. Mantras and chants are typically repeated hundreds or even thousands of times. The mala is used so that one can focus on the meaning or sound of the mantra rather than counting its repetitions. One repetition is usually said for each bead while turning the thumb clockwise around each bead, though some traditions or practices may call for counterclockwise motion or specific hand and finger usage. When arriving at the Guru bead, some assert that both Hindus and Tibetan Buddhists traditionally turn the mala around and then go back in the opposing direction. However, some teachers in the Tibetan traditions and beyond emphasize that this is superstitious and therefore not so important. Within the Buddhist tradition, this repetition of the beads serves to remind practitioners of the teaching that it is possible to break the cycle of birth and death. In case it is necessary to recite a very large number of mantras, Tibetan Buddhist malas have bell and dorje counters (a short string of ten beads, usually silver, with a bell or dorje at the bottom). The dorje counter is used to count each round around the mala, and the bell counter to count each time the dorje counter runs out of beads. After that, the dorje counter is reset. These counters are placed at different points on the mala depending on tradition, sometimes at the 10th, 21st or 25th bead from the Guru bead. Traditionally, one begins the mala in the direction of the dorje (skillful means) proceeding on to the bell (wisdom) with each round. A 'bhum' counter, often a small brass or silver clasp in the shape of a jewel or wheel, is used to count 1000 repetitions, and is moved forward between the main beads of the mala, starting at the Guru bead, with each accumulation of 1000. This is an example of the double-ring onenju used by the Jōdo-shū. In Buddhism in Japan, Buddhist prayer beads are known as ojuzu (数珠, counting beads) or onenju (念珠, thought beads), where the "o" is the honorific o-. Different Buddhist sects in Japan have different shaped juzus, and use them differently. For example, Shingon Buddhism, Tendai and Nichiren Buddhism may use longer prayer beads with strands on both ends similar to those used in mainland Asia. During devotional services, these beads may be rubbed together with both hands to create a soft grinding noise, which is considered to have a purifying effect. However, in Jōdo Shinshū, prayer beads are typically shorter and held draped over both hands and are not ground together. Jōdo-shū is somewhat unusual because of the use of a double-ringed prayer beads used for nenbutsu (recitation of the name of a Buddha): one ring contains single beads used to count a single recitation while the other ring is used to count full revolutions of the first ring. Additionally, other beads hang from the strings, which can count full revolutions of the second ring (flat beads), or full revolutions of the first string of beads. In all, it is possible to count up to 120,000 recitations using these beads. The design is credited to a follower of Hōnen named Awanosuke. This is an example of a Buddhist prayer bead in Japan that has a picture inside the main bead. This photo is of Kūkai, founder of Shingon Buddhism.The text on the left and right is a common mantra devoted to Kūkai. 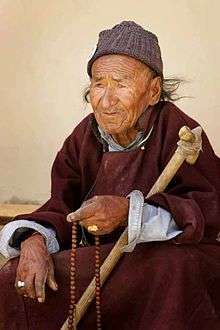 Regardless of Buddhist sect, prayer beads used by lay followers are frequently smaller, featuring a factor of 108 beads. Some beads are made using plastic, while others may contain wood, or seeds from trees in India, such as Ficus religiosa, the same species as the Bodhi Tree. It is common to find prayer beads in Japan that contain a small image inside the largest bead, usually something associated with the particular temple or sect. When held up to the light the image is clearly visible. In Chinese culture such beads are named shu zhu 数珠 ("counting beads"), Fo zhu 佛珠 ("Buddha beads"), or nian zhu 念珠 ("mindfulness beads"). They are used to count mantras, chants, prostrations or breaths. Theravada Buddhists in Myanmar use prayer beads called seik badi (စိပ်ပုတီး [seɪʔ bədí]), shortened to badi. 108 beads are strung on a garland, with the beads typically made of fragrant wood like sandalwood, and series of brightly coloured strings at the end of the garland. It is commonly used in samatha meditation, to keep track of the number of mantras chanted during meditation. There are numerous explanations why there are 108 beads, with the number 108 bearing special religious significance in a number of Hindu and Buddhist traditions. In traditional Buddhist thought, people are said to have 108 afflictions or kleshas. This same number is also used in Japanese New Year services where a bell is rung 108 times. ↑ Watts, Jonathan; Tomatsu, Yoshiharu (2005). Traversing the Pure Land Path: A Lifetime of Encounters with Honen Shonin. Jodo Shu Press. ISBN 488363342X. Dubin, L.S. (2009). Prayer Beads. In C. Kenney (Ed. ), The History of Beads: From 100,000 B.C. to the Present (Revised and Expanded Edition) (pp. 79–92). New York: Abrams Publishing. Henry, G., & Marriott, S. (2008). Beads of Faith: Pathways to Meditation and Spirituality Using Rosaries, Prayer Beads and Sacred Words. Fons Vitae Publishing. Untracht, O. (2008). Rosaries of India. In H. Whelchel (Ed. ), Traditional Jewelry of India (pp. 69–73). New York: Thames & Hudson, Inc.
Wiley, E., & Shannon, M.O. (2002). A String and a Prayer: How to Make and Use Prayer Beads. Red Wheel/Weiser, LLC. Wikimedia Commons has media related to Buddhist prayer beads.